It's the countdown to exams and many hours have been spent madly revising. Whilst covering the content is important, you also need to make sure you are prepared before the day and on top form throughout. Here are our top 12 tips to ensuring the best performance. To ensure you do not forget anything on the exam day, it is best to prepare your equipment the night before. Make sure to check that you have a clear pencil case or wallet to store your pens, pencils and any other stationary that you may have. Check your calculator is working, and if not replace the batteries or find a new calculator. You want to be fully focused on your exam day so try to get at least 8 hours sleep, as being sleep deprived can cause memory shortages. Retaining and the information can be a lot harder with a lack of sleep and tiredness can cause a lack of concentration and a slower completion rate on your exam paper. Look up the details for your exam the day before to prepare for when and where it takes place. You will want to get to the exam centre 15-20 minutes before so that you may find your seat if you need to and it also leaves some time if you get mixed up. You do not want to run the risk turning up late or being excluded from your exam altogether! As the most important meal of the day, a good breakfast can kick start your brain and get your energy levels up for the exam. Aim for something that releases energy slowly, so you don't develop off-putting hunger pangs in the exam itself and concentration levels are at their maximum! Instead of waiting around with your friends find a quiet place to wait calmly. Discussing other topics at the very last minute may divert you away from what you have been revising, or talking socially can cause you to lose focus on the matter at hand. If you have prepared properly for an exam you should go in with confidence knowing you have done as much as you can. There is nothing else you can do now except remain calm and positive, and nerves can throw you off. Make sure you read and understand the questions properly. It's easy to assume a question is asking for something when it's not and forming an answer that doesn't relate. You really can't waste time writing out calculations that are not going to get you any marks. These are essential in the exam and should be written out as clearly as possible. Workings can gain you marks even if you didn't have the correct answer, and often they account for more of the marks anyway. There may be cases where you know the answer, but have not shown any workings and are awarded less or no marks at all. These can be difference between the grade you achieve and the grade above. It is important to have good time management in the exam. 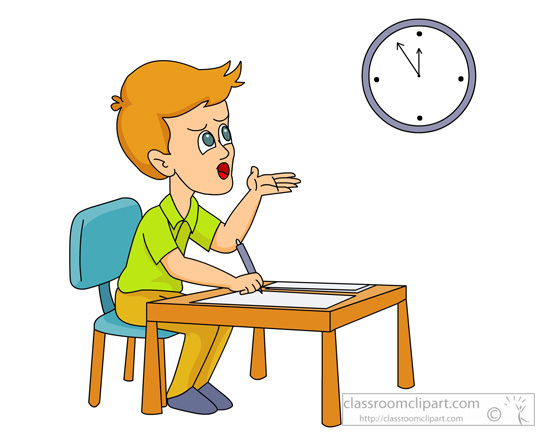 If you have 2 minutes per mark, but are working at 2.5 minutes per mark, you may not be able to finish the exam on time. Manage your time effectively and if a question is taking too long to answer, why not move on to the next one you are likely to answer, then come back to it. Don't leave a question unanswered if you can help it. Try and understand what the question is asking by writing down a few calculations. These could be essential marks and could contribute to your final grade. There is also a good feeling when you finish the exam knowing you have completed or attempted every question. If you have good time management skills or you finish your exam early, don't sit around waiting for the exam to finish. Use this valuable time to check your work and workings to ensuring they make sense and the answer you come to is correct. If you can, put your solution into the question and work backwards and see if you end up at the original question. As tempting as it can be, it's not always best to hang around with your friends after an exam as discussing the outcomes or questions of the exams as this could make you doubt yourself unnecessarily. If you have more exams approaching, you should definitely give yourself a break in-between to prevent a burn out. At the end of the exam you should always be proud of how you have performed. If you have put in all the laborious revision hours and prepared properly, you should rest in the knowledge you have tried your hardest to get the best grade possible. The only thing left is to wait until your grades come out, and we at Maths Doctor hope you get the best grade possible. Maths Doctor wishes you the best of Luck! There are currently no topics.